Australia is full of beautiful, strange, noisy and colourful birds, many endemic (found nowhere else). The bowerbirds are one group of special birds to see in Australia. On a recent Mungo Outback Journey, Wildlife Guides Roger and Michael had a rare and lucky experience. Bowerbirds are the artists of the bird world. Males build art-adorned love nests to attract a mate. 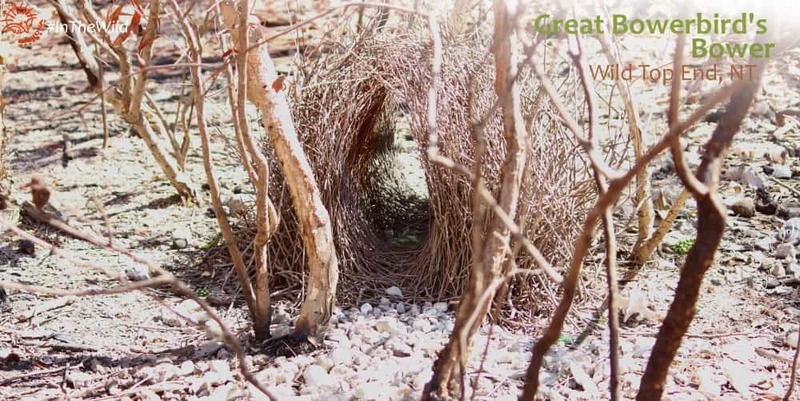 The pic below shows the green-and-white decorated bower of a Great Bowerbird. There are 20 species of bowerbird, and they are only seen in Australia and New Guinea. They are superb mimics, with a huge range of calls and songs, some unique to them, some borrowed from other birds, animals, humans and nature. But there is one sound that seems common to most of our Australian bowerbird species – a churring call. So when Wildlife Guide Roger heard that special call in the distance at Mungo, his ears pricked up. He didn’t know this precise song, but it had elements of the Great Bowerbird, and the gorgeous Satin Bowerbird of East Gippsland. He looked around, and finally located the source of the call – a speck of a bird in the distance. He tried getting closer, but the bird disappeared. Spotted Bowerbirds Chlamydera maculata are the only species of bowerbird known to occur around Mungo, but to Roger’s knowledge they had not been seen there since 2012, and that was only one record. Disappointed, he moved on, fairly sure of what he’d seen and heard, but with no evidence. Two hours later Roger and Michael sat down to a picnic lunch at Mallee Stop in Mungo National Park. Then suddenly, they heard that special call again. 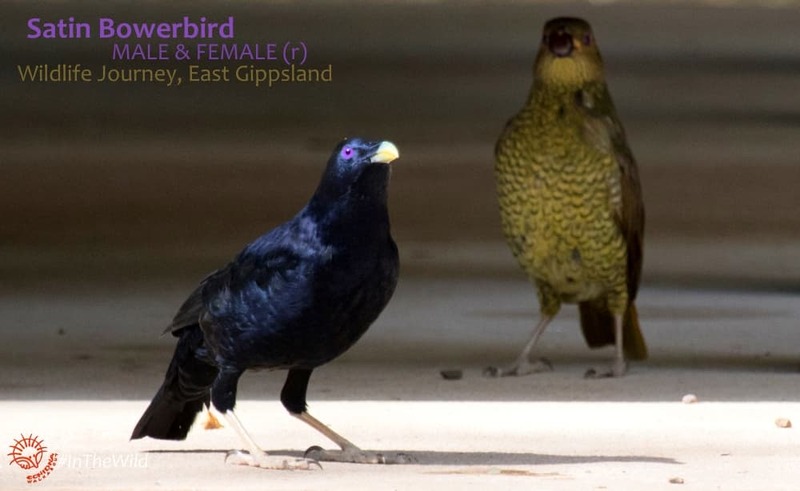 Listen to some Spotted Bowerbird songs on the wonderful Wild Ambience site. Lunch forgotten, they both started looking frantically for the bird. This Spotted Bowerbird wasn’t taking any chances. In she/he flew, and landed straight above their picnic table. It was like she/he wanted to be seen and recorded for posterity. 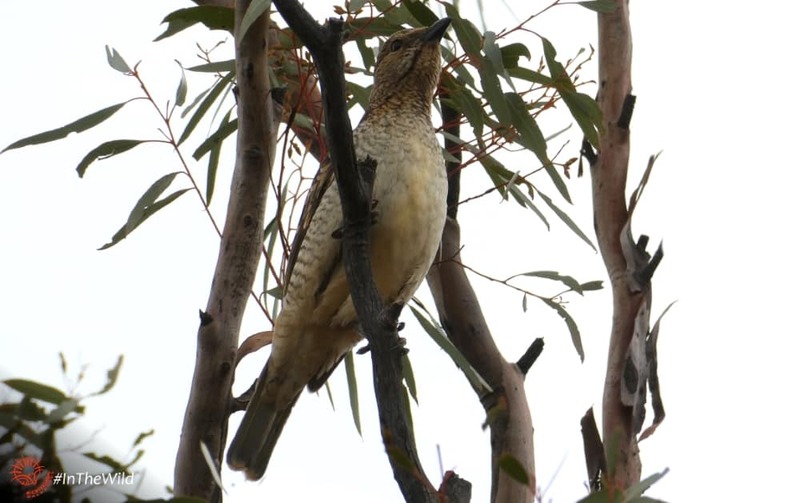 Above their heads the bowerbird sang, and called and showed off in the branches of a mallee tree. Then she flew off. Mission accomplished. 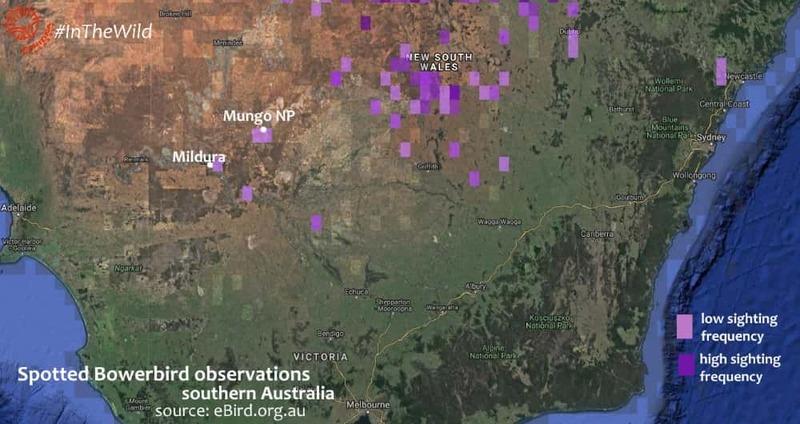 Recording sightings of these special birds seen in Australia is important. Spotted Bowerbirds are a species in decline throughout their arid eastern Australian range. They were once present in large numbers in northern Victoria and eastern South Australia, but are now possibly extinct in those states. The IUCN Red List lists them conservatively as Least Concern BUT DECLINING, and admits that the population statistics are mostly unknown. 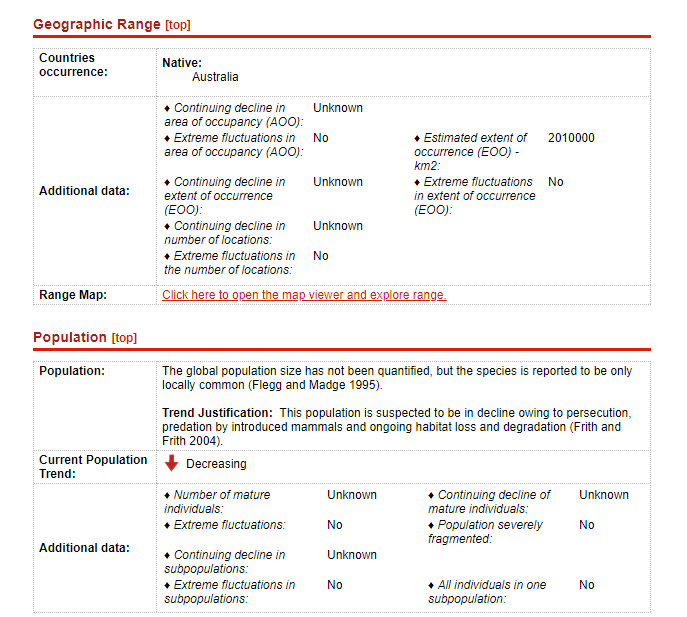 Snapshot of IUCN Red Listing for Spotted Bowerbird. 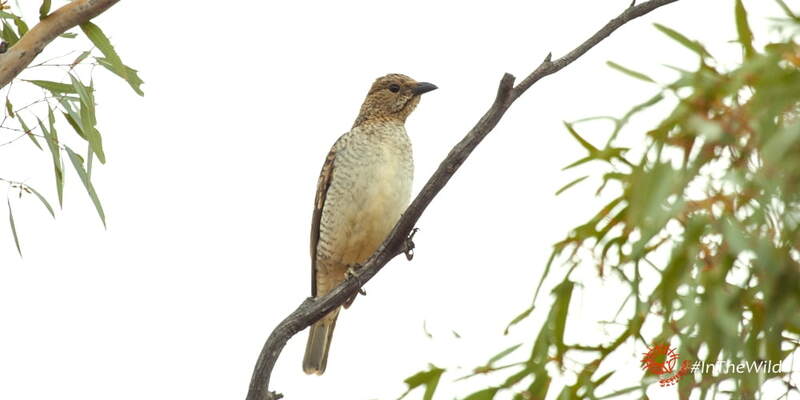 Observations of every single Spotted Bowerbird are critical to the protection of this species. Read more about the threats to Spotted Bowerbirds here. But there is a glimmer of hope. Roger’s sighting was not alone. 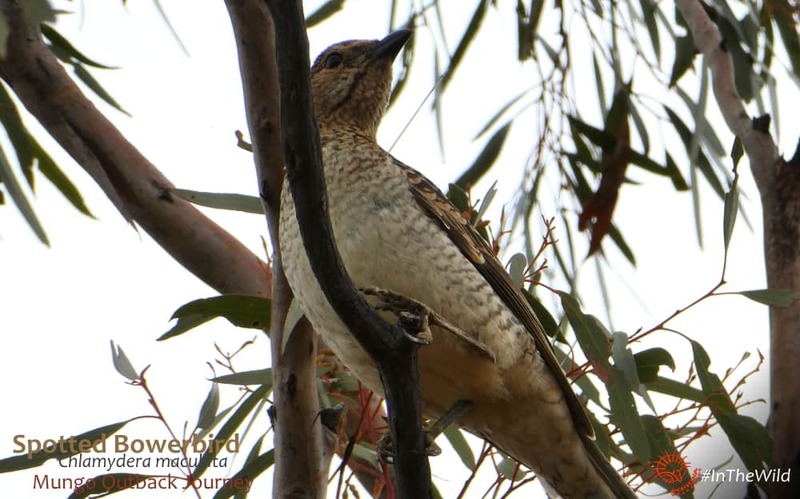 On checking further, we discovered two other recent records of Spotted Bowerbird in the Mungo area – one in April 2017 and another in May 2018. Maybe the species is making a comeback? Wildlife tours, like the Mungo Outback Journey, can be an important contributor to citizen science. The more often professional Wildlife Guides and their keen-eyed tourists are present in a region, especially under-birded regions like Mungo in central Australia, the more special birds they are likely to see. Read more about Echidna Walkabout’s committment to wildlife species atlassing here. The more data scientists and land managers can access, the better they can work towards protecting our special birds.